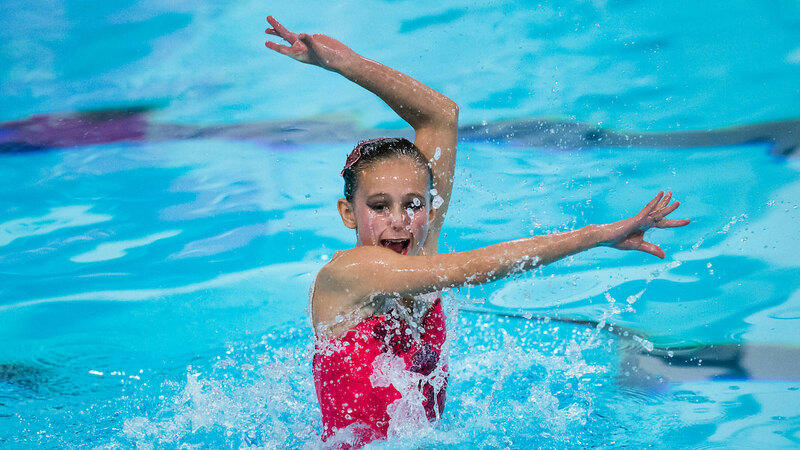 Mimi Gray added the 12&Under Solo title to her Duet gold for a memorable golden double at the 2014 ASA National Age Group Synchronised Swimming Championships in Gloucester. Having finished top in the figures for her age group, the Reading Royals swimmer confirmed her place at the top of the Solo event, scoring 57.8667 for her routine to finish with an overall tally of 123.7412. “I’m really pleased,” said Gray. “That was one of the best performances I’ve done so I’m happy. Gray’s duet partner Abigail Taylor finished second behind Gray for silver, scoring 58.4000 for her routine to music from the film Wreck It Ralph for a total of 120.7768. Reading Royals repeated their result from the 12&Under Duet by securing a clean sweep of the podium in the Solo as Anna Welland clinched bronze, receiving 59.4000 – the highest score of any of the Solo routines – for a total of 119.0039.